The collection and storage of cord blood and cord tissue taken from the umbilical cord of a baby at birth is becoming increasingly common. Cells contained in the blood and tissue, have potential therapeutic value in the treatment of blood disorders, immune diseases and the emerging field of regenerative medicine. Stem Cells are the cells that make up the embryo and are the original building blocks of life. Stem cells develop into various cell types in the body such as: skin, blood cells, muscle, bone, nerves and cartilage. After birth, stem cells are found all over our bodies and they serve to repair and maintain our body cells throughout our lives. Stem cells are abundant in the umbilical cord blood and tissue and can easily be collected at the birth of the baby (less invasive than harvesting them later in life). They are normally discarded as medical waste, making their collection free of moral, ethical and religious concerns. Cord blood is rich in haematopoietic (blood forming) stem cells that are used to treat over 80 blood related diseases. Cord blood is a valuable source of stem cells for a bone marrow transplant and can be used to replace diseased cells with healthy new cells, and rebuild an individual’s blood and immune system. Cord blood is collected immediately after the birth of your baby by your obstetrician or midwife. The umbilical cord is cut and clamped, a needle is inserted into the umbilical vein and blood is collected into a sterile collection bag. Cord blood collection is quick, safe and painless for both mother and baby. Approximately 100-150ml of blood needs to be collected for successful storage. Cord tissue contains mesenchymal stem cells (MSCs) which are stem cells that give rise to the connective tissues of the body i.e. skin, muscle, bone, cartilage, nerve and fat. 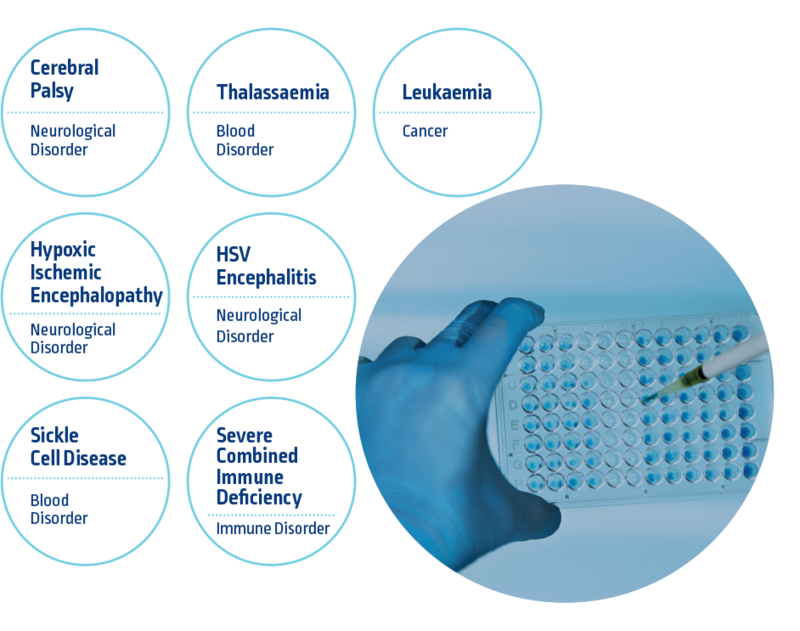 MSCs are being employed in research environments for a wide variety of aesthetic and medical conditions. Cord tissue is collected after the cord blood has been collected and the placenta has been delivered. 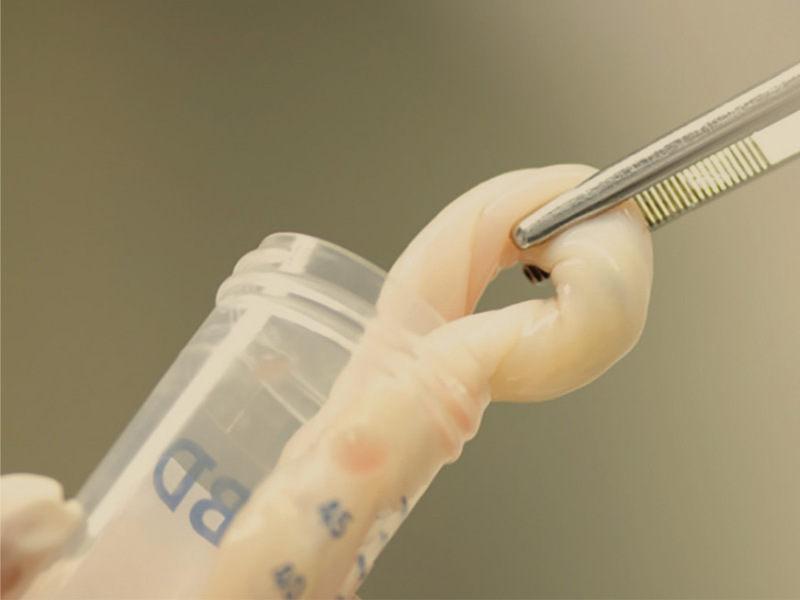 A 10-15cm piece of umbilical cord is cut, cleaned and placed in a sterile collection tube. Allogeneic– Patient receives stem cells from a matching donor, either a sibling or an unrelated donor. To successfully receive tissue from another person, the tissue type has to be the same otherwise the recipient’s system will see it as foreign and it will reject the donated tissue. Autologous– Patient receives their own stem cells. It must be noted that autologous transplantation of cord blood cannot be used in the treatment of inherited disorders. In our bodies, bone marrow is the source of all blood cells. Haematopoietic stem cells are contained in the bone marrow and they continuously make new blood cells to replace old ones. If bone marrow is damaged by disease or medication, it cannot make these essential blood cells, leading to fatal consequences. Therefore, haematopoietic stem cells must be replaced as part of the treatment. This is done via whole bone marrow transplant or stem cell transplant. 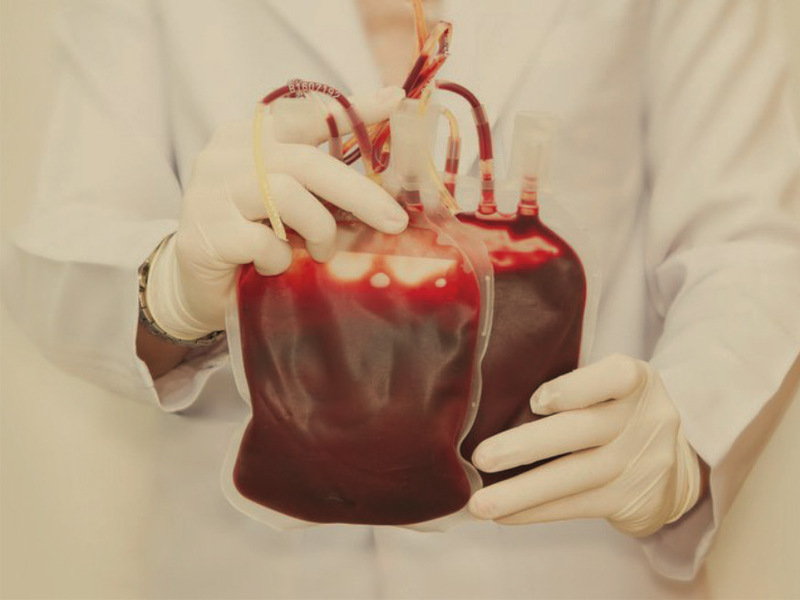 Cord blood is an alternative source of stem cell for a transplant. List of diseases where haematopoietic stem cell transplants are standard treatment. There are also many experimental pre-clinical therapies not yet in human clinical trials for a diverse range of medical conditions. These are being studied either in the laboratory with cell cultures or in animal models similar to the human disease. A “clinical trial” is a study in human patients for an emerging therapy that has not been adopted as standard therapy. Parents’ Guide to Cord Blood Foundation has a portal that allows patients to search worldwide for currently recruiting clinical trials with either cord blood or umbilical cord tissue. List of all diagnoses that have ever been treated in clinical trials with cord blood or cord tissue, in various stages of completion. Who can use the Umbilical Cord Blood Stem Cells? The child themselves – they are a perfect match provided they do not have an inherited or genetic disease. 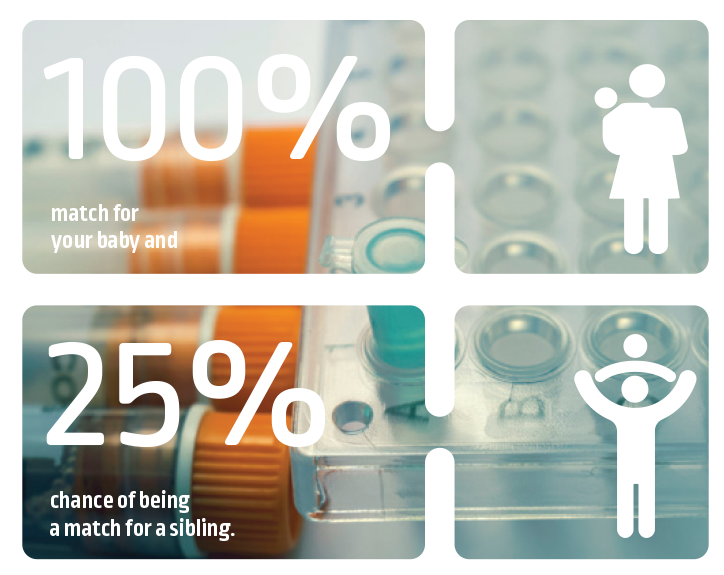 The siblings – 1:4 chance of being a match. The parents – 1:8 chance of being a match. It must be noted that the child gets half their genes from the mother and half from the father. Unless the parents have some matching genes themselves, it is unlikely that the child will be a match to either parent. Parents will be haplo-identical (50% match with their children) but more haplo-identical transplants are being done. Netcells has released cord blood units for autologous use for Cerebral Palsy, the recipients were accepted into clinical trials taking place at Duke University in the States. Smart Cells International, our sister company in the UK, has released a number of samples of stem cells for clinical use. Smart Cells has released more samples than any other private cord blood bank in the UK. What Are The Steps if I Would Like to Bank My Baby’s Stem Cells? The Parent’s Guide to Cord Blood Foundation provides a balanced overview of Stem Cell storage. Next Biosciences strongly recommends that each parent reads their Frequently Asked Questions to gain a better understanding of Stem Cells. Why should I store my baby’s stem cells? Stem cell banking is seen as a form of medical insurance – by investing in the service, you buy a “ticket” to future medical options. However, this is not guaranteed, can take time, and be extremely costly. Does collection depend on the type of birth - Natural or Caesarean section? No. The doctor or midwife can collect umbilical cord blood and tissue at either type of delivery. The umbilical cord blood stem cells are a perfect match for the child whose cells have been stored, and there is a 1 in 4 possibility that the stem cells will be a match for a sibling (brother or sister). Please note, the child’s own stem cells cannot be used to treat certain inherited blood disorders, as the genes that code for the inherited disorder will be present in those stem cells. In this case, a sibling or unrelated donor’s stem cells would be needed. Why should you store both cord blood and cord tissue stem cells? Cord blood and cord tissue contain different types of cells that have different uses. What can they be used for? Bone marrow transplants for blood-related diseases. Connective tissues (skin, bone, muscle, cartilage), nerve (neurological) and organ regeneration. Who can use them? The child (autologous) or a close matching relative (allogeneic). The child (autologous) or a close matching relative (allogeneic). How are they stored? Stem cells are extracted, frozen and stored in a bag. Additionally, small vials of the cord blood are separately stored for testing for a match (HLA-typing). Cord tissue is processed rich in mesenchymal stem cells. This is stored in 5 vials. Preparation for use? Ready to be used upon thawing. Additional laboratory work will be required to expand the isolated stem cells to grow sufficient numbers for therapy. How many times can they be used? Once, with today’s technology. The blood is stored in bags that have the potential to be split. Many times, as mesenchymal stem cells are easily expandable. What are Stem Cells being used to treat? Cord blood stem cells can be used to regenerate bone marrow to treat a range of blood disorders and immune system conditions such as leukaemia, anaemia and autoimmune diseases. They are largely used in the treatment of children but have also started being used for adults following chemotherapy treatment. Cord blood is also being researched for use in regenerative medicine where stem cells may help induce healing or regenerate cells to repair damaged tissues. This research has led to clinical trials using cord blood in experimental therapies to treat cerebral palsy, autism, brain injury and juvenile (type 1) diabetes. Furthermore, many clinical trials are underway looking at the use of stem cells taken from bone marrow. For many of these potential treatments, cord blood stems cells may be a suitable substitute and offer many advantages over bone marrow. Cord tissue contains mesenchymal stem cells that are being employed in both research and clinical environments for a variety of aesthetic and medical conditions, including skin regeneration, neurology (motor neuron disease, multiple sclerosis), orthopaedics (cartilage and bone repair), sports injury (cartilage and ligament repair); cardiology (heart muscle regeneration) and many other areas. Where else can you get stem cells from? If stem cells are not collected at birth, there are other options available. This is, however, not guaranteed, as matches cannot always be easily found, they take time and are extremely costly. Mesenchymal stem cells can be found in most of our tissues or organs, but can be difficult to harvest. They’re most readily available from adult fat (adipose) tissue, but the “young cells” from umbilical cord tissue have better regenerative potential, and are easily collected with no discomfort to mother or child. What is the likelihood of finding a donor? Probability of finding a match for patients in need of an HSC transplant depends on race/ethnicity as our HLA/ tissue types are different. For mixed race children and ethnic minorities (groups under-represented on stem cell registries, Africans in particular) the chance of finding a match is 1 in 400 000. South African Bone Marrow Registry. Autologous (from the patient themselves) transplants .i.e. the donor and the recipient are the same person. In this situation, the child’s own stem cells are used. This would not be possible if the child has an inherited blood disease as the stem cells will have the same genetic problem. Allogeneic transplant (this can be from a related matched family member or a completely unrelated person found on a donor registry). This can be used in the treatment of inherited or non-inherited diseases. Patients are given chemotherapy for blood-related and auto-immune disorders to destroy the existing damaged or diseased bone marrow, and then the new stem cells are infused. The cord blood stem cells are ready to use and require thawing before they are infused into the patient. If your child requires a stem cell transplant your doctor should contact us for all the necessary documentation to decide if the treatment should go ahead. Next Biosciences will only release the stem cells upon written approval from the parents and the treating doctor indicating the date, time and place of the transplant (to allow us to plan the transport of the unit). If an allogeneic transplant is needed (for a sibling) then HLA (human leukocyte antigen) match testing needs to take place. This process takes approximately 3 weeks and requires a blood sample from the child who needs the transplant, and we send off a sample of the cord blood (we store 2 extra frozen vials for this purpose). If there is an acceptable match, the doctor will request the stem cells to be transported to their facility. The cost of transport is for the clients own account. Haemoglobinopathy testing will be done on the donor when the unit is requested for transplant. If the donor is not available, testing may be done on the frozen cryovial sample stored with the unit, which will be submitted by Netcells. This frozen cryovial sample may not be accurately reflective of haemoglobinopathy status, however. The cost of the haemoglobinopathy testing will be for the client’s own account. Can I delay cord clamping and store stem cells? Delayed cord clamping can be beneficial to the baby however delaying for too long (for the cord to stop pulsating) carries the risk of there not being enough blood for cord blood collection. Each case varies as each birthing situation is unique and therefore the final decision must be made by the Obstetrician or Midwife at the time of delivery. Cord blood volume collected will be lower (the majority of the blood transfer occurs in the 1st minute after birth). There is a higher risk for sub-optimal collections especially when also associated with premature deliveries, small babies, thin cords, maternal bleeding, placental abnormalities, multiple birth and maternal complications such as pre-eclampsia and diabetes. The cell counts decrease with increased clamping delay. The success rate of cord blood collection is 7 times higher when clamping is delayed for less than a minute, as opposed to a longer duration of time. Whenever possible delay clamping for at least 60 secs in premature newborns. Delayed clamping is preferred in low to medium income settings where iron deficiency is common. There is currently insufficient evidence to support or refute delayed cord clamping in term infants with rich resources. Provided the mother is not iron deficient and baby is at term, delaying cord clamping by 30-60 secs should ensure a safe outcome for baby and allow for adequate cord blood collection. How many Stem Cells are needed for transplantation? This depends on the number of stem cells stored in each individual unit and the size of the person who requires the transplant. The optimal dose is 10 -20 million nucleated (CD45) cells per kilogram of body weight. The cell counts are different for every collection, and depend on the volume of blood collected as well as other factors in pregnancy. Your baby’s cell counts will be reported to you on your storage certificate. The average number of stem cells collected from an average volume of 100 ml can usually treat up to a 50kg person, but this varies. In larger adults, often two matched units can be combined (either from a sibling or an unrelated donor). Companies are developing techniques to expand (grow more) stem cells in a laboratory environment, and we hope this will become a reality soon. It must be noted that lower stem cell counts are currently being used in clinical trials for cerebral palsy and brain injury, as these recipients are often small, low birth weight babies and children. Does load shedding affect the storage of my baby's Stem Cells? Our storage tanks do NOT operate off electricity. The stem cells are stored in the vapour phase of liquid nitrogen, which is readily available in South Africa. Electricity is critical to our laboratory equipment, and we have UPS backup on all equipment, as well as a large generator, so we can continue to process during load shedding. How long can stem cells be stored and what happens to the stem cells after the paid-up storage period? Theoretically, the stem cells should be able to be stored for the lifetime of the child, as they are cryopreserved and stored at -196 degrees Celsius, where all ageing is halted. However, there is only scientific proof that stem cells are viable for as long as 23 years, as this is currently the longest period in which stem cells have been stored, thawed and tested for viability. You are able to pay for storage upfront for periods of 5, 10 or 20 years. Storage fees currently average around R350 per annum, and these will be adjusted annually for inflation. Storage fees will be market related and, if at any time you wish to move your stem cells to alternative storage location, you’re welcome to do so. Why are Stem Cells controversial? More than 90% of the work involving stem cells is not controversial. This includes research, accredited processing and storage facilities such as ours and legitimate therapies being administered around the world. Embryonic stem cells are derived from embryos and result in the destruction of the embryo and the loss of potential life. Netcells is not involved in any form of embryonic stem cell science. 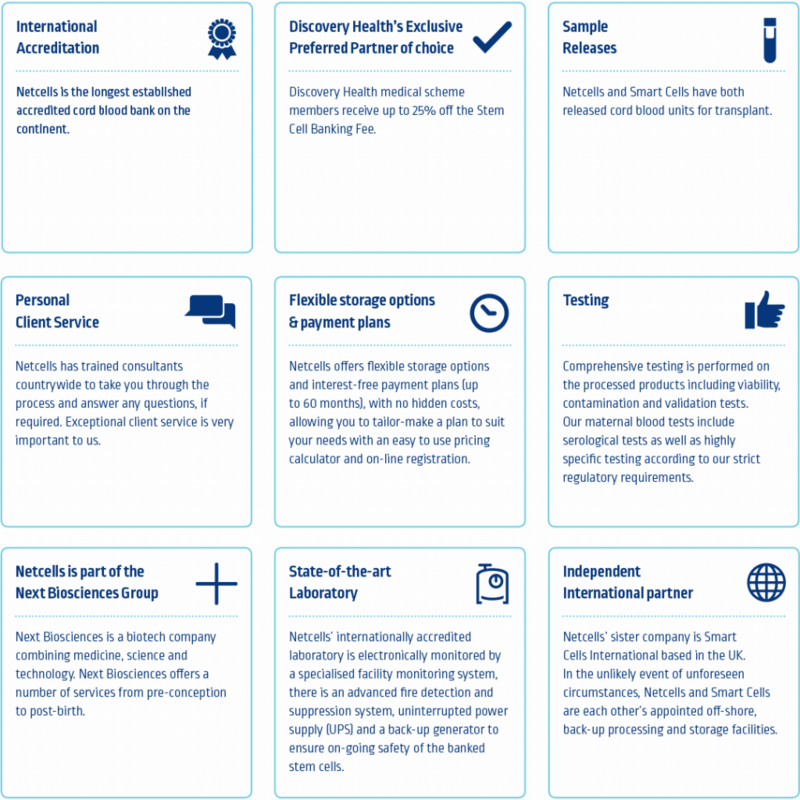 Cloning is banned worldwide in humans, as it involves making a copy of a something from a single cell. Non-regulated stem cell clinics operating worldwide offering unproven therapies at exorbitant prices to many vulnerable and desperate patients. These unproven treatments generally don’t comply with the ethical, legal and scientific standards required of registered clinical trials. Netcells is a processing and storage laboratory, and as such, does not offer treatments to clients. We facilitate the handover of stem cells to the transplanting unit or trial centre. Have any stem cells that have been stored with Netcells been released? Netcells has released two cord blood units to date: the first cord blood unit was released in March 2015 to treat an eight-month old baby boy with cerebral palsy and the 2nd cord blood unit was released in July 2016 to treat a two-year-old boy with Cerebral Palsy. Both units were accepted into stem cell treatment programmes taking place at Duke University in the USA. We have had a few siblings who required stem cell transplants but these were unfortunately not a match. Our sister company Smart Cells in the UK has already released 19 cord blood units for the treatment for cerebral palsy, thalassaemia, leukaemia, brain injury, severe combined immunodeficiency disorder, sickle cell anaemia and encephalitis. Is officially accredited by an international recognizable body to give you assurance that the lab adheres to the strictest international standards for processing and storage. Official accreditation means regular independent audits of the actual facility with a certificate registered to the physical location of that laboratory. How long has Next Biosciences been in business? We collected our first cord blood unit in 2005, and to-date have stored stem cells for over 15,000 babies. What guarantee is there if something happens to the stem cells or Next Biosciences? Our sister company, Smart Cells international (the UK’s longest established stem cell bank) will take over the storage of the stem cells in the unlikely event of anything ever happening to Next Biosciences. Next Biosciences and Smart Cells employ similar technology so it is easy to transfer cells between the two laboratories. Next Biosciences and Smart Cells are each other’s offshore back-up laboratories and Netcells has processed and stored stem cells for Smart Cells clients from all over the world, when there have been flight disruptions in the UK and Europe due to weather (volcano, snow) and strikes. What happens if I have paid in full and then the cord blood is not able to be stored? Netcells will always refund the portion of fee relating to the service that wasn’t utilized. Additionally, Netcells takes the risk on processing, so if for whatever reason there are not enough stem cells for storage and you don’t store, then Netcells will refund the Banking Fee and Storage Fee. The stem cells are stored in cryogenic tanks at our laboratory in Midrand. You are welcome to visit our laboratory at any time to come and see how we process and store stem cells. Can I divide my child's cord blood stem cells and store them at two different locations/laboratories? How secure are my stem cells and what guarantees are there that some of the cells will not be used for research? As this is a private bank and we store for your family only, we do not carry out HLA-typing on the stem cells and therefore we will never know if they are a match for anyone else. Additionally, we comply with the Human Tissue Act and therefore are not permitted to use your stem cells for research without your prior written consent. What is the difference between local and international storage? Once the cord blood and tissue are collected, the cells start deteriorating, so it is imperative to get this to the laboratory as soon as possible. Local storage ensures less transport risk (courier delays, customs clearance, weather disruption, extreme changes in temperature) so that the cells can arrive as soon as possible at the laboratory with least risk of being compromised for processing. If we emigrate can we move the Stem Cells? It is recommended that you continue to keep the stem cells stored with Netcells until they are ever needed for a transplant as one does not want to stand the risk of thawing them unnecessarily. However should you wish to move the stem cells you may do so- the stem cells can be shipped in their frozen state anywhere in the world to another stem cell bank that accepts them for storage. The cost of this will, however, be for your own account. What is the procedure should we need to use the Stem Cells? You will need to liaise with your medical practitioner, who will contact us and inform us that the stem cells are required for transplant, indicating the date, time and place. Netcells will only release the stem cells upon written approval by the mother and treating doctor.